Club Spotlight – Each month we recognize a club for outstanding accomplishments in helping it’s members achieve their goals, in marketing the club, in member growth and sustainability. Augusta 326 has a team of members who set the bar high in their standards of excellence. Members work diligently with the executive team to set and reach goals. Members are active and responsive to each other. This club is one of the oldest standing clubs in the state of Georgia with a little over 73 years of legacy. They have an active Facebook page and a very active and hands on executive team. 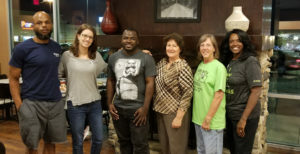 They welcomed their newest executive team member, Pierre Fede. He has hit the ground running. They have a wonderful SAA, Eldon Smith, who makes sure the meeting starts without a hitch. The VPPR, Emily Aquadro, comes up with great ideas to enhance Public Relations. The VPE, Christine Van Bemmel, keeps the members goals first and foremost. 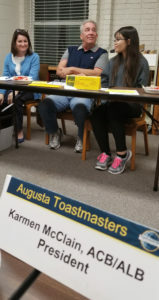 Their treasurer, Laura Rollins works with the VPM to make sure members are entered into the Toastmasters International website as soon as possible so that they can get started on their Pathways Journey. Their Secretary, Greg Slowick, keeps accurate records so they have history of the great things that are going on in the club. 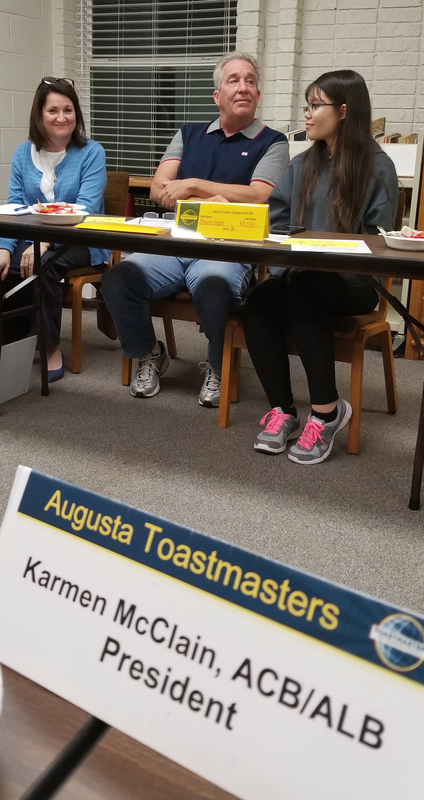 Congratulations Toastmasters Club #326 On Being Selected As Our Club Spotlight For October! We Are Looking Forward To Celebrating Your Club Becoming President’s Distinguished This Year! WAY TO GO! You can tell that the club works hard and plays hard. The teamwork shows! It is wonderful to be recognized for what comes natural to the members of Club 326. I have been a member since 2015 and I have been poured into since day numero uno. I love being a member and honored to represent them as their President and Area 52 Director. We, the club of 326, are honored to be a part of Distririct 14. I call in an organization without borders. Like Christopher Columbus coming to America, he brought with him ideas that lead to a new beginning. When we visit the clubs without borders, we bring back and share new ideas that make our club better. We are proud to be in the number of great clubs in Are 52, Division E, District 14, and Toastmasters International. Congratulations to Augusta 326!! You continue to be a leader in the Division and we appreciate all of your efforts and how you continue to motivate the club with so many new members. You have a strong legacy that we can all draw upon and we thank you aa!! Thank you for setting the bar high, the District is so proud of your accomplishments! Congratulations!!! You guys know how to learn and party at the same time.. OUTSTANDING JOB!! Its an honor serving all of you! Amazing job! Congratulations Club #326 on being a strong, active, and supportive club. This club is the benchmark for success! Congratulations Augusta326! We are thrilled to see your consistently superb example recognized and draw immense inspiration from all you do to inspire clubs within the division to follow your lead! As we say in the U.S. Navy, Bravo Zulu.